On July 11 th 1998, my life was ominously transformed by an encounter with the once-familiar subjects of my research. Having been hired by the University of Wyoming a decade earlier to study the ecology and management of rangeland grasshoppers, I thought that I pretty much knew these insects. I had spent that fateful morning gathering data from research plots. A week earlier, my field crew reported that to the north, where deep draws were etched into the prairie, the grasshoppers were reaching biblical proportions. I decided to see for myself. The earthen banks rose above my head as I descended into the gulch, where the insects had massed into a bristling carpet of wings and legs. My arrival incited pandemonium. Grasshoppers ricocheted off my face, tangled their spiny legs into my hair, and began to crawl into the gaps between shirt buttons. In a recurring nightmare from my childhood, a swelling, suffocating amorphous mass inexorably filled my room. By time I reached adolescence, this dream became less frequent. As an adult, the only echoes were a vague discomfort in crowds, an intense reaction to Hitchcock’s The Birds , and a persistent fascination with the concept of infinity—until that nightmare metamorphosed on the Wyoming prairie. After frantically sweeping the grasshoppers from my body and scrambling back to the truck, the blind, irrational, unaccountable terror receded. I tried to forget what had happened. But I couldn’t. I was an entomologist, and this was like a riveter on a skyscraper suddenly experiencing a debilitating dread of heights. What happened in that rangeland draw challenged my rationality and, to be honest, my mental health. And when a scientist is bewildered, there’s an obvious response: research. My hope was that by understanding the infested mind, I could engage in psychological pest management. The first task of a researcher is to clarify fundamental concepts—I had experienced fear and was wrestling with anxiety. Fear is the heart-pounding response to present danger, and anxiety is the disquiet that comes from anticipating danger. I figured that if I could master my straightforward fear, the troublesome anxiety would vanish. But fears can be messy, having both proximate and ultimate manifestations . For example, a person frightened by cockroaches (proximate) might believe they will invade her body (ultimate). Or a person who blanches among thronging grasshoppers might harbor an existential dread of being overwhelmed. Moreover, a simple fear can “spread” into a pool of anxieties. The person who is afraid of cockroaches might become apprehensive about looking under the sink. Likewise a fellow frightened by a grasshopper swarm might harbor misgivings about entering gullies—and worry that he’s heading toward full-blown phobia. About one-in-ten people develop a phobia in the course of their lives, and nearly 11 million people wrestle with entomophobia . This condition is defined as a severe, persistent, and unreasonable fear of insects or their relatives. 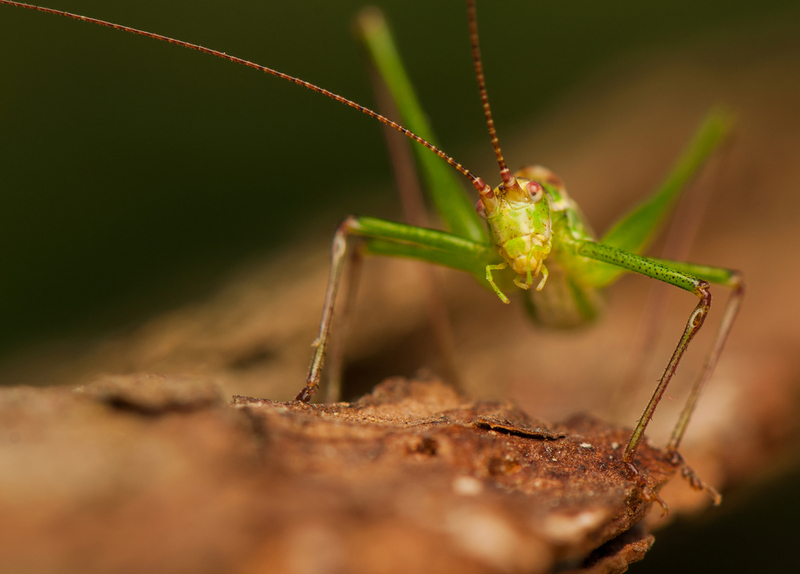 Spiders top the list , but the runner-up is grasshoppers (followed by ants, beetles, moths, butterflies and caterpillars). So what accounts for our dread? In short, a conspiracy of nature and nurture. Evolution favors anxious genes. That is, when our ancestors mistook a tumbling leaf for a spider or a grass seed for a louse, it meant nothing more than an unnecessary flinch or some pointless scratching. But mistaking a viper for a tree root meant elimination from the gene pool. From the perspective of evolutionary psychology, the cost of survival may be a lifetime of inherited discomfort. Critics note that the objects of phobias oftentimes don’t occur in nature ( e.g., clowns ). But even if some scientists overstate the evolutionary case, it is clear that the human mind is not a blank slate. We are born with tendencies to readily learn things that favor our survival. English fits our inborn expectations of language structure; grasshoppers fit our innate template of fearful objects. But evolutionary psychology has a few unpatched holes. We fear harmless (even downright beneficial) species. A swarm of locusts was a nutritional windfall for most of human history. From an evolutionary perspective, I should have been like a kid in a candy store. My youthful encounters with grasshoppers were darkly enchanting. On lazy summer afternoons I’d snag a few and feed them to the black widows that colonized the cinderblock wall in the backyard of my Albuquerque home. I don’t know what memories might have conspired to induce my panic, but psychologists contend that adult fears often reflect childhood learning via direct experience (a cockroach runs up a kid’s pant leg), modeling (a kid sees his mother scream in terror at cockroaches), and instruction (a kid’s father tells her a story about cockroaches burrowing into children’s ears). Modern culture provides abundant opportunities to learn an aversion toward insects. Arthropods were featured on the big screen in the 1950s, with giant ants ( Them! , 1954), spiders ( Tarantula , 1955), and grasshoppers ( Beginning of the End , 1957—I knew it). In The Fly (1958, 1986), the hero’s body is melded with that of the insect and soon the chimeric character manifests the amoral tendencies of an insect. Today’s ‘reality’ shows continue the tradition of enculturating fear and loathing. We are not clearly predisposed to either fear or love insects, evolutionary psychologists and biophiliacs notwithstanding. Insects and their kin have provided stings, bites, and infections as well as ecosystem services, scrumptious snacks, and moments of delight. In short, evolution assures that we notice these creatures, and culture shapes our responses—and our therapies. Specific phobias are both readily diagnosable and treatable . So why do only one in eight sufferers seek relief? Because they find workarounds. Entomophobes simply don’t go into the storage shed or look under the sink. But what if you’re an entomologist? I returned to the field a week after my panic attack but couldn’t get closer than the edge of the gully. Realizing the absurdity of my condition, I challenged myself to give a plausible reason for fearing grasshoppers. I worked my way through what I later learned was an approximation of Cognitive Behavioral Therapy (CBT), which is sort of a “best of” album for psychological treatments. In CBT, the therapist functions as a trusted teacher, structuring a series of empirical experiments with the feared object and directing the ‘student’ to draw reasoned conclusions about the implausibility of the dreadful hypothesis. The overarching principle of CBT is to help the patient become a scientist, with the mind and body being the subjects of detached inquiry. A trip to Australia provided the ultimate test. I asked a colleague to take me into a swarm of plague locusts “to take photographs” (I was too embarrassed to reveal my actual reason). Being engulfed by millions of insects was mesmerizing—but not terrifying. The unfathomable surge of life evoked a sense of wonder tinged with eeriness rather than a heart-pounding nightmare. I returned to my entomological research, but it was not the same. In many ways it was better. The insects were never again merely objects of detached investigation. What happened in that draw led me ineluctably to the interface of the sciences, humanities and arts where I now reside. And I’m not afraid to say that I’m grateful. Jeffrey A. Lockwood is the author of The Infested Mind: Why Humans Fear, Loathe, and Love Insects (Oxford University Press, 2013).